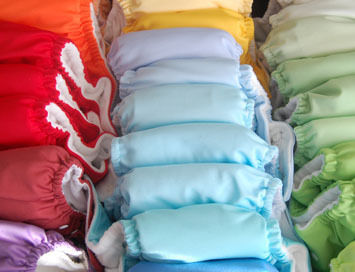 Cloth Diapering Community forces CBS News Reporter to reconsider cloth. You might remember that back on November 4, Natali Morris reported during a segment called "Cloth versus Disposable" on their Eye on Parenting segment. Her report sparked quite the controversy. Initially cloth diapering advocates were ecstatic, as we always are, when modern cloth diapers get a little time in the spotlight. Confident that any "cloth vs. disposable" battle will result in cloth being the clear choice for economical, environmental and health reasons. But to our dismay, Natali's segment proved to be a disappointment. It appeared that the segment was thrown together with what looked like about five minutes of preparation and the product lineup for comparison included a pack of Gerber prefolds compared to a pack of "convenient" to use disposables. No comparisons were made between disposables and modern pocket diapers, onesize diapers, fitteds, or aio's. The segment stunned the cloth diapering community and immediately damage control began. Advocates, retailers and manufacturers alike rushed to pick up the pieces and refused to allow a two minute, ill prepared segment to tarnish cloth diaperings reputation. Just one day after her controversial "Cloth versus Disposable" segment Natali and after an overwhelming response from viewers and fans of cloth, she announced on the CBS website that she would accept a proposed "Cloth Diaper Challenge" where she would give "real" cloth diapers a try for 30 days and report back with her findings. Cloth Diaper Challenge Update, Cloth Diaper Challenge Do-Over, Cloth Diaper Challenge Day 1. Now that it's been 30 days....Natali says she's a cloth diaper convert! Visit this link to watch her new, updated, "Cloth Diaper 101" segment where she thoroughly discusses the different types of cloth diapers, how they work, how convenient they are and of course, how cute they are! A big thanks to Natali for letting our voices be heard and giving cloth another try! We greatly appreciate it!